Gas-powered. These pressure washers are the most powerful and offer the best of both world: mobility as well as great PSI and clean. Electric-corded. 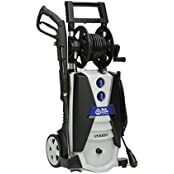 Electric pressure washers offer solid power but come with the hassle of having to deal with an extension cord. Battery-powered. Very portable but not as powerful as the others. You’ll also have the risk of running out of battery power unexptectedly. Pressure. Measured in PSIs (pounds per square inch). This is the power or strength with which the water is coming out of the washer. The higher the number the more power the machine has and the cleaner the job it does. You can buy a machine with pressure as low as 1000 PSI or as high as 4500 PSI and above. Water consumption measured in GPM (gallons per minute). This is the amount of water coming out of the pressure washer. GPM works hand in hand with the PSI. The higher the numbers, the more power the machine has and the cleaner result you can expect. Pressure washer water consumption can be as low as 1.5 GPM and less or 4.5 GPM and more. Look at the comparison table to find the most suitable pressure washer for your needs. If you want more information then make sure to read our individual gas pressure washer reviews below the table. 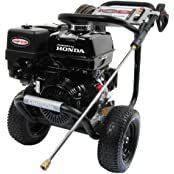 The Honda powered SIMPSON PS3228-S is a portable pressure washer for diverse cleaning needs. Its 3300 PSI means it can eliminate dirt, mildew, grime and other filth on various areas. It features an abrasion resistant and kink hose, a moreFlex hose capable of withstanding heavy-duty jobs. Nozzle tips can be selected from four different choices of 0°, 15°, 25° and 40°. SIMPSON PS3228-S includes a safety lockout, welded steel make and pneumatic tires each 10 inches in thickness. 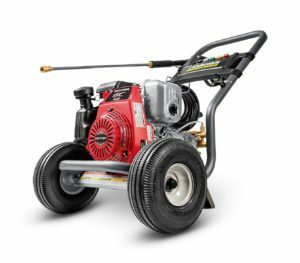 Powered by a GX200 Honda engine, the PS3228-S can be used on diverse surfaces from garden fences, windows, marble, wooden, tiled, patios, furniture, rooftops, decks to prepping internal exterior for (re)painting. The SIMPSON is sufficiently small and lightweight to be handled by a single person and created for use in stores and homes. Important to check that everything works fine and there’s nothing missing; verified customers have complained about customer service, missing or broken parts etc. Amidst being easy to assemble and simple to operate, following instructions is key. With the Duromax XP3100PW you’re promised a turbo pressure washer that blasts grime, filth and dirt in equal measure. With a cleaning power of 3100 PSI at 2.5 gallons for every 60 seconds, it’s believable it can tackle various cleaning jobs. It comes with an in-built detergent reservoir assuring a steady cleaning agent flow. Duromax XP3100PWT blows up dirt stuck on the roof, stucco, sidewalks, gutters, driveways etc. The spray gun has a high pressure hose around 30 feet in length; you might have to purchase a garden hose capable of supplying water. Ensure the wand fits in as some have had to replace the handle due to fitting issues. A straight 3100 PSI, it comes with 4-5 different tips catering for assorted applications. It has a 1-year warrant and features a lawnmower noise level. Verified buyers concur it’s a superb powerful blasting washer but worth ensuring no part arrives broken or missing. It has happened before. 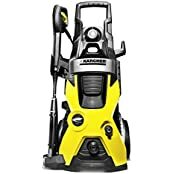 Promising a quicker, cleaner pressure wash, the Karcher G3000OH is a gas powered pressure washer powered by a GC190 Honda engine described as a maintenance-free pump with a head made of brass. The pneumatic tires are fixed on metal wheels with the frame steel welded. Connect nozzles are quick five pro-style variants from 0°, 15°, 25°, 45° to 65°. The high pressure hose is 25-feet long including a detergent siphoning hose and can remove even such dirt as moss. Pressure adjustment is absent. The G3000OH includes nozzles, hose and engine oil and doesn’t return to low idle; it’s an on/off choke and switch system. Pull-cord start is easy even for an older person. 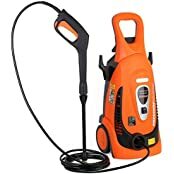 It has already been used in cleaning cars, RVs, porches to vinyl siding, but important to ensure the unit and hose don’t meet to avoid melting the hose. Praised for its designed, build and ease to starting and use, do ensure it has all the parts during delivery. 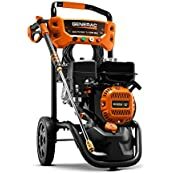 Generac 6598 is a home pressure washer with a 212cc OHV engine. Delivers a reliable cleaning performance with an axial cam type of pump. Its hose connections are easy to access (you don’t have to kneel down to connect the hoses). The ¾ integrated two gallon tanks offer a suitable storage onboard for lots of cleaning detergent. The spray gun is high performing with thicker cushion handle for extended usage. Stability is added by a longer barrel while the trigger is simple to pull, diminishing fatigue. 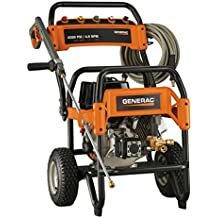 Generac 6598 has a PVC hose of 30 inches connecting to the spray gun’s rear-end. Nozzle includes quick click choices of 0°, 15°, 25° and 40° as well as a soap applicator. Includes a sealed pump and an engine oil quart in the box. Easy to move about, change the tips and cleans outside the house, tiles driveways and patios effectively. Nonetheless, verified buyers have complained of short lifespan and refusal to start after a year of non-use. 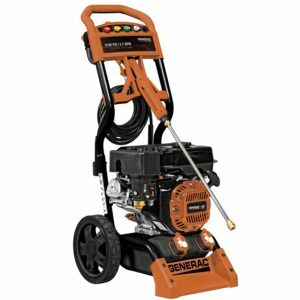 Generac 6922 is a pressure washer touted for its ergonomics. 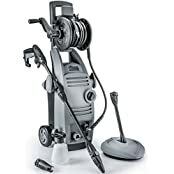 Gas powered, it features 2.4 GPM and a 2800 PSI for combined cleaning power of 6720. It’s powered by 196cc generac OHV engine. High pressure hose is 25 inches long including a ½ gallon detergent tank. 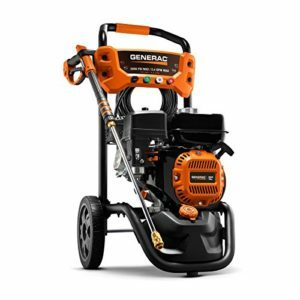 Generac 6922 power washer promises ease of use, reliability and top cleaning power in a compact affordable unit; capable of diverse cleaning from decks, patio, rims and tires, brick, cement, furniture to driveways. Self assembly, all parts are included plus connecting hoses. Nozzle tip options include 0°, 25° and 40° plus a soap applicator (dedicated nozzle tip). It doesn’t have a PSI regulator. The 6922 has an 8-gallon fuel tank. While using on cars the 40° nozzle should be selected for painted surfaces. Hose melts easily after getting into contact with the muffler while pressure wand extension could easily unscrew even as the suction tube could hinder cleaning. Some verified buyers have also complained it fails to start after first usage. Ensure all parts are included, none is missing or broken. 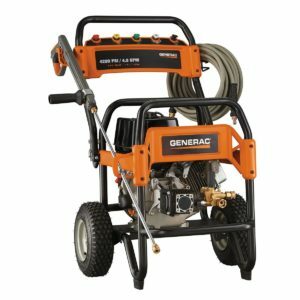 Pressure washer with broad uses in diverse cleaning tasks from patio scrubbing, paint prep, concrete scrubbing to rim and tire cleaning, the Generac 6565 features a 4.0 GPM and a 4200 PSI. The gas powered pressure washer is ideally for commercial usage. Features pneumatic oversized tires for effective shock absorption and better mobility. Together with a soap applicator, the Generac 6565 also includes five nozzle tips from 0°, 15°, 25° to 40°. To safeguard its 420cc Generac OHV engine, it includes a low-oil type of shutdown sensor. The commercial pressure washer has a 3-year manufacturer warranty and weighs 146 pounds. While restarting it’s wise to pull the wand trigger to release pressure, especially if the pull cord seems stuck. Runs hot water too and includes a 50-foot hose. 3600-3800 PSI is the lowest adjustable PSI. Not the easeist to start according to some verified buyers, with complaints of damage during shipping. Replacements though have been reported. 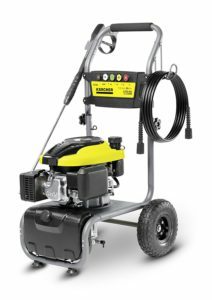 The Karcher G2700 is a KPS 196CC engine gas powered pressure washer. It includes a 25-foot high pressure hose, onboard tank for detergent, axial cam pump and 8-inch pneumatic tires. Five-quick connect spray nozzles of soap, 0º, 15º, 25º and 40º ensure the right cleaning task is assigned the right nozzle. A 3-year limited warranty and 2-year axial cam pump warranty ensures the 2700 PSI water pressure generator is a reliable product. Child safety lock is included on the spray wand to avoid injury. Folding handle assures convenient storage in compact spaces. Gas tank is 4 gallons in capacity with a black nozzle to allow pressure adjustment. Maximum idle time is five minutes and not made for use with cold water; as the cold water flows out of the pump it cools the system. Nozzles shouldn’t be left on to avoid rust. There’re a few verified buyer complaints about the design of the handle and broken, bent, twisted or damaged parts. 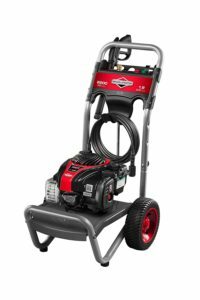 Briggs & Stratton 20656 is gas pressure washer of 2.7 GPM and 3000 PSI, courtesy of a 190cc professional series engine. Choke or prime isn’t needed due to its ready start. Base is all steel and heavy duty minimizing corrosion. Quick-connect four spray tips include soap, 0, 15 and 40 degrees. Wheels are never-go-flat of 10 inches each. Unit also includes a high pressure 30-foot hose, user guide and operator manual add engine oil. Extra features include thermal relief for high temperature for purging overheated water to protect pump; improved stability courtesy of a footprint. The 20656 has a commercial warranty of 90 days and a limited 2-year consumer warranty. 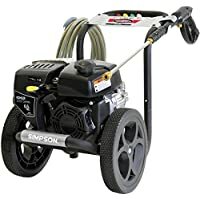 A plug and play pressure washer, it doesn’t come with a water hose (only a 30-foot spray hose) although 50-100 foot garden hoses have been proven to work with the Briggs & Stratton 20656. A cleaning product dispense is included. Great for power washing garage and barn doors and other surfaces before painting. On gravel driveways of uneven surfaces the base of the unit can be unstable. 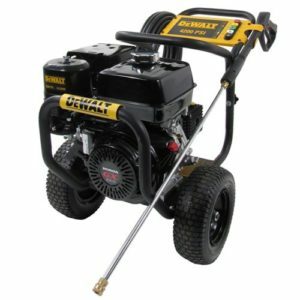 Dewalt DXPW4240 is a gas pressure washer featuring 4.0 GPM and 4, 200 PSI powered by a Honda engine. The pressure washer comes with a 3/8-inch by 50-foot high pressure hose. Quick connect steel wand and quick connect spray tips are detergent, 0, 15, 25 and 40 degrees. Great for barbecue grill and engine grease clean up with warm water. Dewalt DXPW4240 has a one-year warranty. While it can be used to clean diverse surfaces and very easy to use, the pressure can be humongous as much as pressure variance can be low or high with a change of nozzles helping to change the pressure. Verified buyers claim it’s easy to start, powerful and sturdy and either comes with a comet pump or a general pump. Tiring with extended usage, it has a low oil level unit shut off. Due to the raw absolute power of the engine, verified users have requested care while cleaning to avoid doing more harm than cleaning. 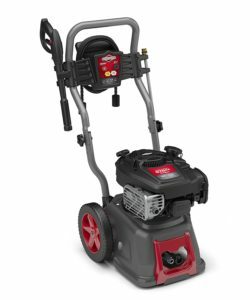 Briggs & Stratton 20545 is touted as ideal for pressure washing patios, sidings, trucks, cars and other surfaces to blast dirt off. It features 1.9 GPM due to an OHV 550e Series engine producing a rotation of 5.5-foot pounds. Unit also comes with an axial cam free pump. For an output of high pressure the Easy Start enables, including effortless starting. Never go flat 10-inch wheels assure ease of mobility. Unit enjoys two-year limited warranty. A 25-foot long high pressure hose allows easier cleaning to surfaces a bit far off. Also features a 0.2 gallon fuel tank but lacks a pressure adjustable regulator. The four stroke engine include gas and oil separately, considering the pressure washer uses typical gas with the oil added into the engine for longevity and better usage. Quick connect spray options are three, from 25 degrees, 0 degrees and soap predefined patterned spray. While it works well, some verified buyers have cried of cheap quality and low standard packaging. 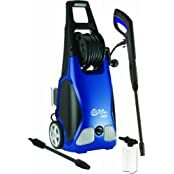 It’s difficult to pick a single best electric pressure washer that would suit everyone’s needs. Therefore, we’ve put together this comparison table with information most commonly searched for. Take a look at the features, price, etc and pick the electric washer that suits you best. As you choose the best pressure washer have the kind of job you want to do in mind. Making the best choice out of tens of pressure washer reviews will be easy, from professional cleaning engagements, commercial cleaning to residential cleaning jobs, such as spring cleaning just after the dusty and untidy summer months. Having your cleaning intentions in mind will help ensure the most ideal machine for the rightful application has been selected. For home use, the best pressure washer is perhaps an electric one with 1300-1900 PSI. It’s superb for washing cars, patios, grills, small decks, lounge furniture, play sets made of plastic, among others. Choose a lightweight, compact pressure washer with a high-pressure flexible hose. Electric pressure washers are quiet and rather light with little in terms of maintenance required. Exhaustion emissions are absent and stop or start through a trigger. A compact size means that an electric pressure washer can be kept indoors. Nonetheless, the low pressure will translate in slow cleaning. The nozzles and wands made of plastic aren’t as strong as metallic ones. Being electric mean an outlet is required around the area of activity. 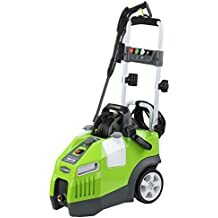 The best machines for shop use and residential homes with an improved cleaning power are gas-powered pressure washers. A range of 2000 PSI to 3100 PSI should be fine. It means a grimy surface will be cleaned within a third of the time it would take the fastest electric pressure washer. However, expect the gas-powered machine to be heavy, noisy with cumbersome tune-ups, fuel-mixing and even pull starting. 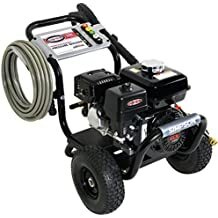 In colder regions winterizing the pumps using anti-freeze would be needed considering, unlike the electric pressure washer, it cannot be stored in a residential property. Lots of control and user caution is needed in gas ones to lower the risk of damage to the surface being cleaned while avoiding injuries to the user. With a gas pressure washer of between 3200PSI and 4200 PSI, you’ve a gas model ready for professional duty such as surface preparation, stripping paint, cleaning a construction site, maintaining a fleet, removal of tough graffiti, among other applications. 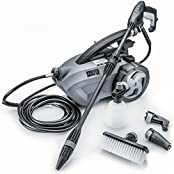 The rule of the thumb is that in case maximum power is all you need, including rapid cleaning, gas powered models are the best. But for simple home use and residential surroundings the convenient choice would be electric models. In a nutshell, while choosing the best pressure washer PSI (pounds per square inch), the pressure output is a critical factor. It can help you determine the best model to choose. 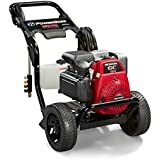 Light-duty: 2000 PSI and lower pressure washers that are superb for cleaning sidings such as boats, trucks, cars, fences, decks, driveways, sidewalks and patio furniture. 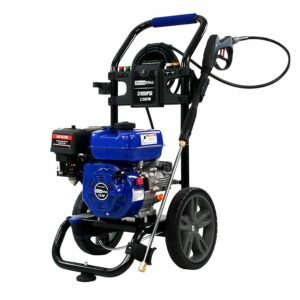 Medium-duty: Models generating 2000 PSI to 2800 PSI and apart from handling those cleaning jobs also done by light-duty models, they’re exceptional for cleaning patios, decks, fences and sidings. Heavy-duty: With a PSI of 2900-3300 these models will rapidly complete cleaning jobs, including sidewalks and other small sections with the additional benefit of handling wide driveways and other large areas like cleaning a second story or preparing surfaces for paint application. Professional/extra heavy duty: Any pressure washer with a 3300 PSI and above falls in this category. They handle diverse cleaning jobs the other models can handle, but bring in extra power in the job, especially in paint prep projects. Apart from PSI, it’s important to note the gallons per minute (GPM), which is the volume of water the pressure washer promises to deliver. A higher PSI mean intense cleaning while an increased GPM represent quality cleaning and ensuring surfaces hard to reach are rinsed perfectly. As such, to ascertain the best pressure washer with the best cleaning power both GPM and PSI are important considerations. The larger their combined number the larger the cleaning efficiency. The best pressure washer should have an onboard soap tank. Otherwise, you’ll have to grapple with using lots of different containers. Another advantage is a cord and tool storage. A pressure washer with wheels is much better in case it’s a heavier model, such as a gas-powered 4200 PSI model. Rather than replaceable nozzles, go for the convenience of adjustable nozzles as a simple twist will have the spray pressure or width changed with ease. Nonetheless, replaceable nozzles are better off when you desire certain spray angles to extend spraying options. 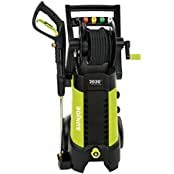 Own or Rent a pressure washer? When it comes to owning your own pressure washer or renting for a few hours, day or week, it draws down to a few things. 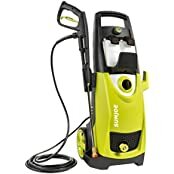 Frequency of use-How long do you intend to pressure wash? Do you need the machine once every year during spring cleaning or to complete a single yearly surface cleaning? If you only need a pressure washer once a year renting makes a lot of sense. However, if you love cleaning your roof, deck or concrete walkway a couple of times annually the cost-effective solution is to get your own. Where a pressure washer is required for a day job only, without the need of the equipment in the near future, it might be wiser to rent. Cost-The cost of the best pressure washer varies, especially if you run through all the pressure washer reviews around. 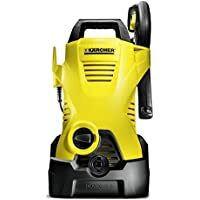 Renting a pressure washer depends on the area where one lives. Considering the cost of hourly or daily renting the equipment vis-a-vis the cost of buying the type of model you want, you can easily know whether renting makes sense or buying one is the answer. For instance, rather than rent $65 per day three times a year or more, purchasing a gas-powered $280 pressure washer is better. Repairs and maintenance-Renting a pressure washer mean that any malfunction will be handled by the owner and not you. If you decide to purchase one, you must factor in repairs and maintenance. There’s always a chance the item could break down or some parts destroyed or require replacement. Owning a pressure washer requires dedicated maintenance. Standing on a surface that’s stable throughout to ensure you’ve a solid footing and good general balance. Using the manufacturer specified type of eye protection and proper specified hearing guard in the case of a noisy gas model. Avoiding being distracted so much that you leave an active spray gun running and unattended. Choosing the right spray setting or nozzle considering nozzles that focus their power intensely can destroy various surfaces. If not sure find more about spray settings and spray tips from the user manual that’s fit for the type of surface being cleaned. Being aware all the time of the area the spray is always directed. Avoid pointing the spray gun at plants, animals or people. Power lines, power sources and electrical fixtures should be far from the line of the spray at all times. As already mentioned, the spray angle and the orifice size of the nozzle determine a specific pressure of flow of water. Familiarize yourself with GPM and PSI to ascertain the best cleaning power for the kind of cleaning project in your hands. An increase in the size of the nozzle will see the pressure washer’s PSI reducing without a change in the flow. Using the un-loader to lessen the pressure diminishes GPM and PSI. The trick is to reduce PSI of the pressure washer you’re using by having the nozzle size increased to keep GPM maximum. The spray angle can be anything between 0 (zero) and 65 degrees. Lots of contract cleaners will not have any difficult with 25 degree spray angle wash patterns. But 40 degree spray angle wash pattern is a preference of many contract cleaners; it allows them to hold the nozzle and to be nearer the surface being worked on. The same contact width is obtained that delivers an intense pressure and increased temperature right at the heart of the contact point. Even so, keeping the nozzle a good distance away consistently from the surface is important. Zero degree type of nozzle mean that all the cleaning power will be concentrated on the smallest area with an impactful cleaning power heavily at the center. As a result, the cleaning effort is done with tremendous power. Note that some zero degree nozzles leave tracers or wand marks that a rotating nozzle can easily solve. Preparing for the emergency: Which power generator? OnlyTopReviews is an American-owned publication. We bring you home & garden and health & beauty guides, product reviews, and comparison tables that make sense. Our mission is to make our readers’ lives easier by helping you make a purchasing decision that you won’t have to regret. What is the best mobility scooter to buy in 2019? Best MIG Welders in 2019: 110v and 220v. Only Top Reviews All rights reserved.